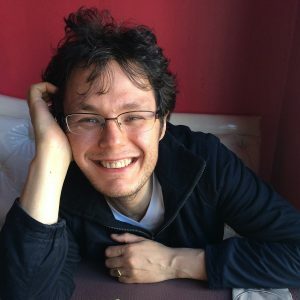 Ilya Kaminsky (born April 18, 1977 in Odessa, Soviet Union, now Ukraine) is a Russian-American poet, critic, translator and professor. He began to write poetry seriously as a teenager in Odessa, publishing a chapbook in Russian entitled The Blessed City. His first published poetry collection in English was a chapbook, Musica Humana (Chapiteau Press, 2002). His second collection in English, Dancing in Odessa (Tupelo Press, 2004), earned him a 2005 Whiting Writers’ Award, the American Academy of Arts and Letters Metcalf Award, the Ruth Lilly Fellowship, and the Dorset Prize, and was named the 2005 ForeWord Magazine Book of the Year in Poetry. In 2008, he was awarded a Lannan Literary Fellowship. His poems have appeared in literary journals and magazines including The Kenyon Review, New Republic, Harvard Review, and Poetry. His latest book is Deaf Republic (Graywolf, 2019).